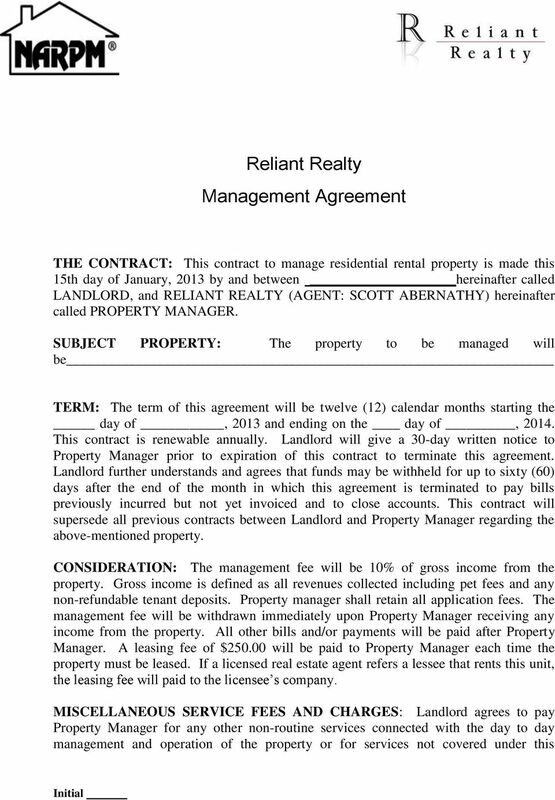 Download "Reliant Realty Management Agreement"
4 month in which the deficit balance is reported to Landlord. Landlord agrees to report any error or discrepancy in writing within thirty (30) days of receipt of monthly statement. Failure to report any such error within thirty (30) days of each statement, constitutes a waiver of any such claim. MINIMUM BALANCE: Landlord agrees to maintain a minimum balance of three hundred ($300.00) dollars per unit in Property Managers Trust Account at all times. If regular monthly payments are to be made on Landlords behalf, a minimum of three hundred ($300.00) dollars per unit plus the total of these monthly payments is to be kept in Property Managers Trust Account at all times. CALAMITY/SALES: Landlord will assume responsibility of any major renovations due to natural disasters, insurance claims and/or rehabilitation for sale of the property. PROPERTY CONDITIONS: Landlord will allow Property Manager to make necessary repairs to the property to offer tenants a quality home. 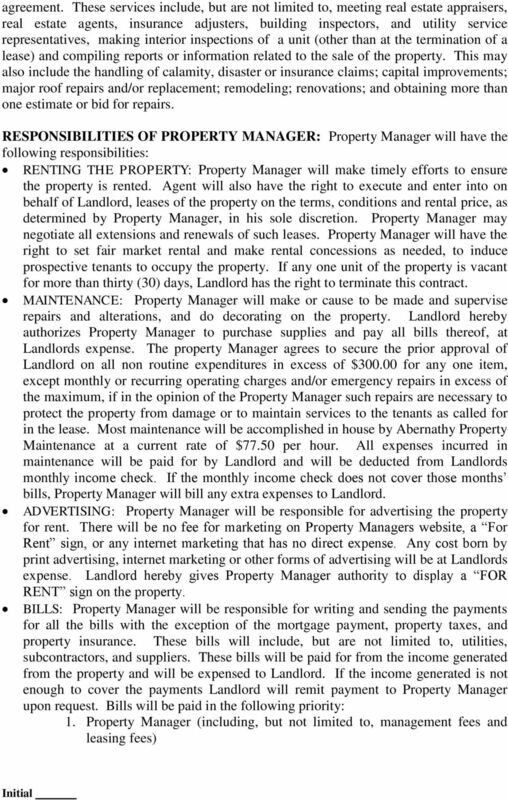 If Property Manager feels that Landlord is not offering a good quality of living for the tenants, Property Manager may terminate this contract. OTHER ITEMS: EMPLOYMENT OF AGENT: Property Manager is a licensed real estate agent and shall act as exclusive agent of Landlord to manage, operate and maintain the property. NOTICES: All notices in this agreement shall be in writing. These notices may be in electronic form, such as or fax; hand delivered; or delivered by U.S. Postal Service. HOLD HARMLESS: Landlord further agrees to hold Property Manager harmless from all damage suits in connection with the management of the property and from liability from injury suffered by any employee or other person whomsoever, and to carry, at his/her own expense, necessary public liability insurance adequate to protect the interest of the parties hereto, which policies will be so written to protect Property Manager in the same manner and the same extent they protect Landlord. INDEMNIFICATION: Property Manager shall not be deemed as a guarantor for the collection of any rent payment. 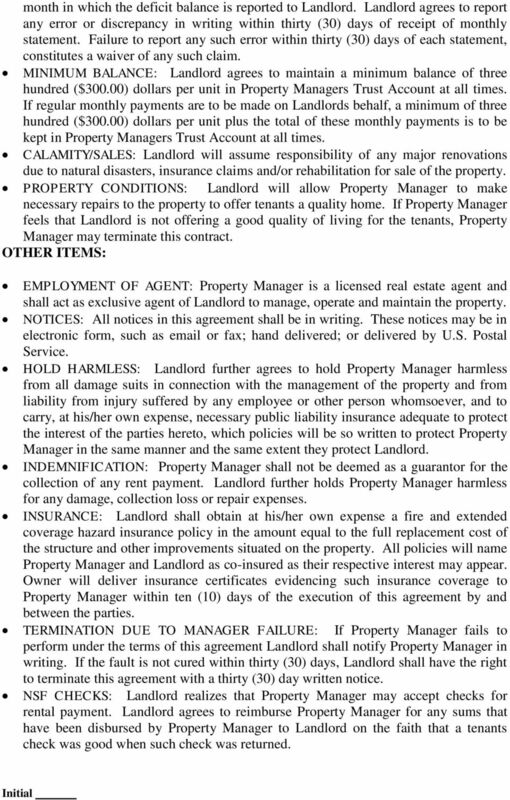 Landlord further holds Property Manager harmless for any damage, collection loss or repair expenses. INSURANCE: Landlord shall obtain at his/her own expense a fire and extended coverage hazard insurance policy in the amount equal to the full replacement cost of the structure and other improvements situated on the property. All policies will name Property Manager and Landlord as co-insured as their respective interest may appear. Owner will deliver insurance certificates evidencing such insurance coverage to Property Manager within ten (10) days of the execution of this agreement by and between the parties. TERMINATION DUE TO MANAGER FAILURE: If Property Manager fails to perform under the terms of this agreement Landlord shall notify Property Manager in writing. If the fault is not cured within thirty (30) days, Landlord shall have the right to terminate this agreement with a thirty (30) day written notice. 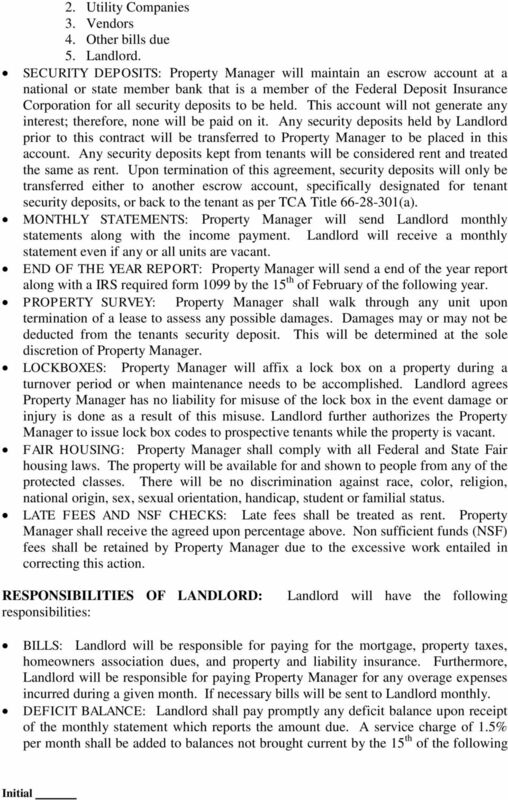 NSF CHECKS: Landlord realizes that Property Manager may accept checks for rental payment. Landlord agrees to reimburse Property Manager for any sums that have been disbursed by Property Manager to Landlord on the faith that a tenants check was good when such check was returned. upon the terms hereinafter set forth, for a period of twelve (12) months. RESIDENTIAL LEASE-RENTAL AGREEMENT This is a legally binding Agreement; if not understood, seek competent legal advice prior to signing. California Commercial Lease Agreement. 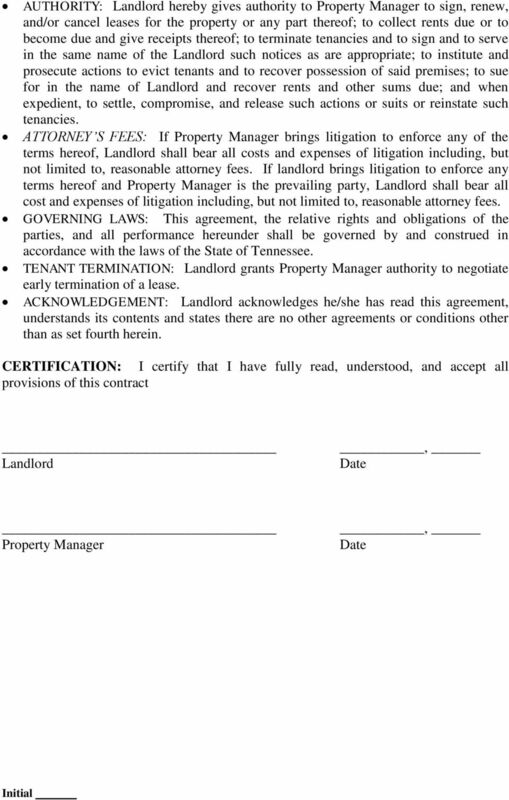 This Commercial Lease Agreement ("Lease") is made and effective between ("Landlord") and ("Tenant").